If you’ve decided to have a garage sale, the worst thing that could happen is having to drag back nearly all that stuff indoors. The whole point of a sale is to get rid of items you no longer need. Your aim is to ensure you remain with little to nothing. Whereas, the perceived or actual value of the items you put up for sale does play a major part in determining how successful the sale will be, often garage sales fail because of other factors. By paying attention to the following tips, you can get people to scramble for and drive away with your old stuff as they leave you counting the cash. You just never know how many people will come to your garage sale and how early they’ll do so. Plan with a sizeable crowd in mind. It’s a sale so your conversations with buyers will revolve around price. To avoid getting bogged down in endless questions around how much each item costs, you can place stickers on the items at least a day before the sale. If you have many items, you could gather all stuff that goes for the same price, place them on a table and append the price tag on the table itself (e.g. ‘Each item on this table goes for $5). For the higher priced items, consider preparing an invoice template (or you could download one for free e.g. https://www.freshbooks.com/invoice-templates/category/creative). You bought those designer shoes for $400 ten years ago. It’s unlikely you’ll find anyone willing to pay a quarter of that. Actually, you’ll be lucky to get $10 for the pair. And that’s alright. While it’s great to make money during a garage sale, it’s important to remember that this is also an opportunity to get rid of stuff you no longer need. If you set unrealistic prices, you can expect to hold on to the items for a long time. On the brighter side, you should see selling the items at dirt cheap prices as your small contribution toward spreading good around the world and brightening a stranger’s day. Put Up Signs. Lots of Them. 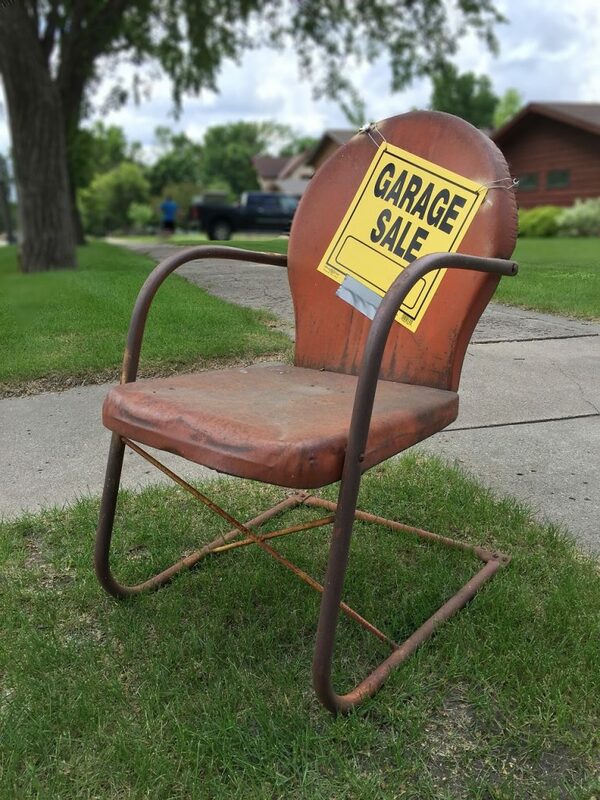 A garage sale isn’t supposed to be a secretive, invite-only event (unless the items you are putting up for sale are so valuable that you want to vet buyers beforehand). Ergo, the more people you can get to come over, the better the prospects of a successful sale. Spare no effort (within your budget of course) to raise the event’s publicity. Usually, the majority of buyers will be from your neighborhood. So put up colorful posters that quickly draw reader’s attention. Use large letters so the text is legible from a distance and also for people with poor eyesight. Keep the message short, simple and clear. State the address, date and time of the sale. Place the signs in strategic locations where they’ll be visible to as many people as possible. A garage sale doesn’t mean that you’ll necessarily be selling items from inside your garage. Chances are you’ll bring the things to your yard for visibility and also to ensure that you maintain your privacy by not having strangers coming into your home. So, if the stuff will be on the yard, make sure people who may not have seen your posters can spot from a distance that there’s something going on. There are multiple ways to do so and you don’t have to rely on just one method. You could for instance string multicolored flags between the trees or fence posts of your front lawn. You could also save the biggest poster for your yard; a giant sign that enthusiastically announces everything has to go. Make sure there’s a clear line of sight to the items on the yard for anyone passing by. Someone who wasn’t interested despite seeing your posters may just change their mind once they notice something they’d be interested in. You don’t have to drag knick-knacks, tables and furniture every weekend for a month or two. If you plan the garage sale well and give it all you’ve got, you can sell nearly everything within one day. These tips can help you do just that.